You can now transfer your photos, videos and other files in a hassle-free way from your iPad or iPhone to your laptop or computer. Yes, you heard it right! IOTransfer 3 is excellent iPhone transfer software through which anyone can transfer photos, videos, etc. with just one click and that too without any USB cable. IOTransfer is an excellent alternative to iTunes. You can now share all your favorite pictures, videos and music anytime anywhere with your family and friends. iPhone, iPad owners can enjoy music just the way they like. Let’s check out some of the other features of this unique iPhone transfer software. Do you love watching YouTube videos? Then this software is the ultimate solution for you. You can now watch videos on YouTube and various other channels for free with the help of this software. Along with that, you can access over 100+ sites including Vimeo, YouTube, Facebook and so on. Additionally, you can even download them with the help of IOTransfer 3. So, you don’t have to face any hindrance while watching your favorite videos online. With just one click import videos from your iOS devices to your PC or computer. If you want to take data backup, you can even do unlimited iPad or iPhone video transfer. IOTransfer 3 enables you to convert videos into different other files in the most convenient way. You can convert them into MP4, MP3, MKV, AVI, FLV and more. Also, you can transfer them from your iPhone, iPod, iPad, and PC. Usually, whenever you convert videos, you lose its quality. But with IOTransfer 3 you’ll receive the original quality of the video without any failure. So, if you want to enjoy the videos only, you can check them in the highest quality. It’s time to forget iTunes and USB cables entirely because IOTransfer helps you to transfer all your pictures, music, videos, etc. instantly without any USB cable or iTunes. You just have to access a Wi-Fi connection. With the help of wireless iphone transfer, you can transfer anything anytime from your iPhone, iPad, PC or iPod. The best thing is with the help of this software if you have a great Wi-Fi connection you can even do bulk delete or take the whole backup of all your files. If you want memory in your phone to store your favorite things, don’t forget to try this excellent software, IOTransfer 3. This is because you can now do the bulk delete with the help of it. iPhone, iPad or iPod owners who try to free the space of their phone by deleting the pictures one by one, now can delete useless files in bulk. Isn’t it a great feature? 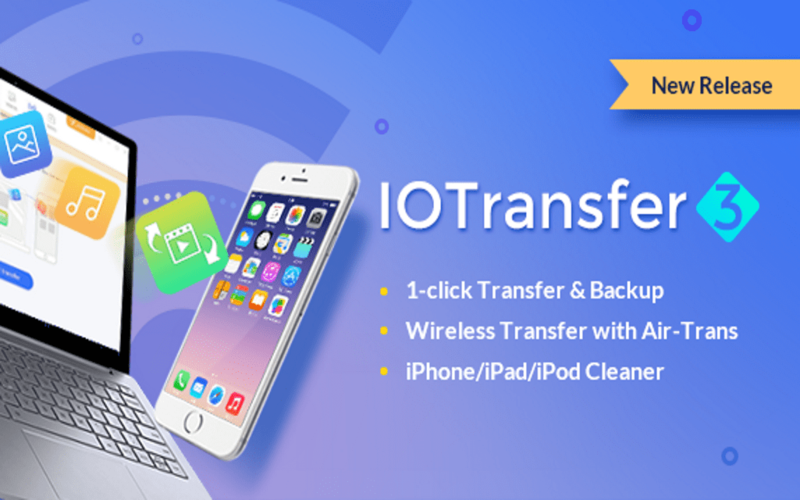 So, if you are hunting for the easiest way to take the back up of your data or if you want to transfer files with just one click, don’t forget to try IOTransfer 3 once. It’s the most natural solution for the iPhone, iPad and iPod users.